I didn’t manage to do a block a day, as I’d intended to do. I did an awful lot of working myself into exhaustion this month, had my annual “Holy F***! I’m drowning in Helpdesk tickets! !” panic attack, and have managed to answer an absurd number of emails and phone calls in my attempts to keep my Helpdesk to our customer service goals. Then, I’ve come home, written quite a bit in my fiction groups, and slept a lot. This weekend hasn’t even been exempt from overworking myself – I just spent three hours answering emails. I could have left them, but my campus’ first day of classes is Tuesday. The idea of leaving my students to answer fifty or more emails on that day, without including emails coming in on that day alone, just chafes the wrong way. (Not that there is a right way for chafing…). I’ll be doing a bit more tomorrow – I normally run a report on Mondays, but I’m off for Labor Day, and it needs to be done for meetings on Tuesday. I’m going to have a stupid number of hours in this week. Anyway, on to the sewing! In addition to having completed the top for Sunsets and White Beaches, I completed the backing. In retrospect, I almost wish I’d matched the repeat. Honestly, though, I’m freaking lazy after the month I’ve had, and done is better than anything else. The thing is sandwiched and ready for hand-quilting. 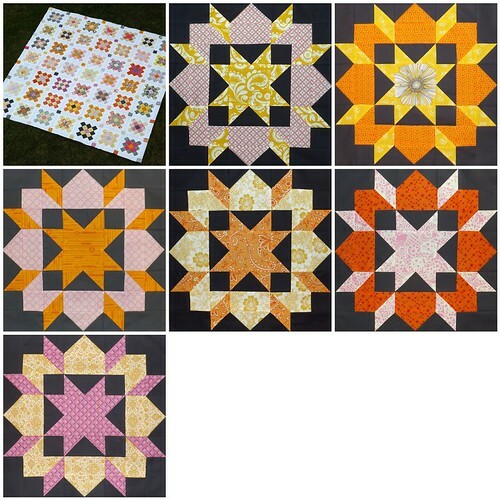 I also got through six Swoon blocks, one of which I will probably pitch, or pick apart and do-over, for better points and seams nesting properly. I re-organized my sewing area a bit, adding a table and a rolling stool to make my efforts much more ergonomic. I’ve also designed my very own quilt labels, for printing at Spoonflower. Once I have them in hand, I’ll share some photos of the actual labels. I figure it’s about time I actually document my quilting efforts and label the quilts so that my efforts aren’t lost. I’ve purchased a crazy amount of fabric lately – retail therapy, and the desire to complete a couple of quilt designs that have been developing in my mind for a while. Not gonna share photos – I’ll shame myself out of going to the WI Quilt Expo this coming weekend. Speaking of – anyone else going?